Dylann Roof at Centralized Bond Hearing Court on June 19, 2015, in North Charleston, S.C.
Dylann Roof, who was convicted in December of killing nine black parishioners in Charleston, S.C.’s Emanuel African Methodist Episcopal Church in 2015, has been wearing shoes adorned with racist symbols to court as recently as Monday, the Daily Beast reports. Roof, who is representing himself in the murder trial and who testified that he has absolutely no remorse for the June 17, 2015, killings during a Bible study, has been rocking prison-issued kicks with hand-drawn racist symbols on them for the past two months. FBI Special Agent Joseph Hamski testified Friday that he has seen runes and a Celtic cross drawn on the insides of Roof shoes, and saw these popular white supremacist symbols as early as November, when Roof’s trial began. Authorities also found the symbols inked on a pair of shoes seized during a search of Roof’s jail cell 16 months ago. On Friday, Hamski also detailed Roof’s online activities on a neo-Nazi site called StormFront. Using the name “LilAryan,” Roof sought out other white supremacists in South Carolina and shared his feelings about white women who are romantically involved with black men. Roof, who is representing himself in court, asked no questions of Hamski during cross-examination. 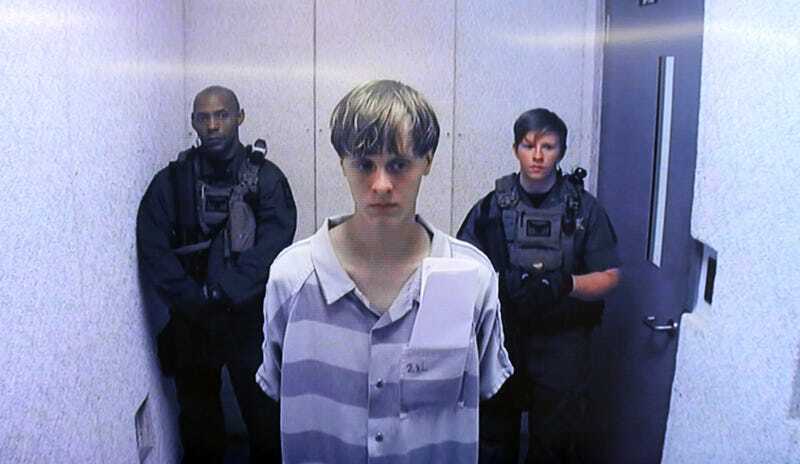 While family members of the victims emotionally testified about their loved ones, Roof has reportedly stared straight ahead at a wall without emotion during the trial. The 22-year-old, who may be facing the death penalty for the heinous murders, has been hit with 33 federal charges, including a slew of hate crimes. The New York Daily News reports that prosecutors plan on wrapping up their case Monday. Jury members will presumably begin deliberating Tuesday to decide if Roof should face death or spend the rest of his life in prison. Read more at the Daily Beast and the New York Daily News.